RARE!!! VERY LIMITED STOCKS LEFT!!! 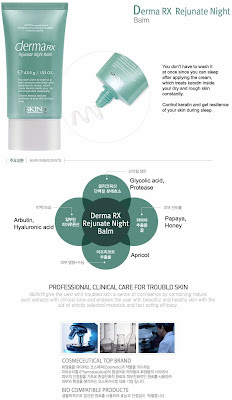 Usage: Cleanse face, pat dry, apply toner, then apply this Skin79 Derma RX Rejunate Night Balm, control keratin and get resilience of your skin during your sleep. Wake up to softer and smoother skin. Glycolic acid penetrating into the skin effectively and an enzyme resolving protein get rid of thick keratin and make your skin smooth and sleek by keeping the Turn-over of your skin normally cyclical and making your skin into a condition open to nutrition supply. Contains fruit acid such as pomegranate extract and vitamin C and helps to prevent aging skin and accumulation of keratin cells, the cream makes your skin more energetic and protects your skin for a long time. Suitable for different ages from adults to even children with soft skin, particularly to the skin with keratin and roughness for the external environment, since the product is absorbed lightly and softly to prevent your skin from being dry and increase resilience.